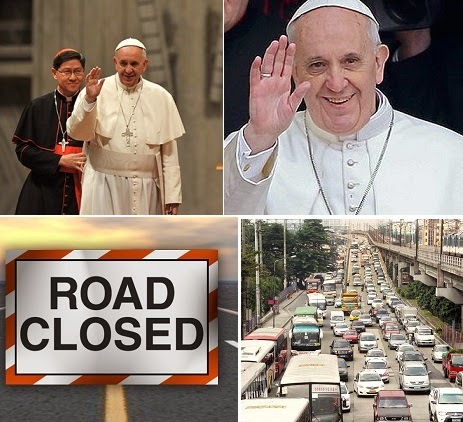 Metro Manila Development Authority continues to update motorists on the closed roads and alternate routes to be used on the arrival of Pope Francis on January 15 to 19, 2015. MMDA had announced the routes to be used for the papal convoy and the other alternate routes that can be used by motorists. Francis Tolentino, MMDA Chaiman, had reminded the motorists that the announced roads used for the papal convoy will be closed three hours before the Pope’s arrival. Alternate routes had been announced to help those who uses private and public vehicles despite the expected inconveniences as the Pope travels from Villamore Airbase to Apostolic Nunciature. For those planning to go to northbound through Sucat Road, along Kabihasnan you should turn right at Coastal Rd. Turn left at Pacific Ave, turn right at Macapagal Boulevard, then you should turn right to EDSA. Turn left upon reaching Arnaiz Ave, turn right at Amorsolo St, turn left at Rufino St, then turn right at Chino Roces Avenue, Turn Left at Jose P Rizal going straight to Tejeron towards your destination. Those who wants to travel from EDSA to Coastal cam turn left to Macapagal Blvd along EDSA, turn left at Pacific Ave then turn right to Coastal Ave towards destination. Those going to Manila through Taft Avenue can follow two alternate routes. You can turn right to POcampo St, turn right to Arellano Ave, then left to Zobel Roxas finally turning left to Onyx. Another option is turning left to Estrada instead of Zobel Roxas. Turn at Singalog, then right to Esquerra finally turning left to Angel Linao. From Luneta take T.M. Kalaw or Pedro Gil to go to Paco. Along Taft Avenue, turn left at Pedro Gil if going to Sta Ana. MMDA asked for cooperation and patience from the motorists as inconvenience will be expected coinciding with the arrival of the Pope.